Fred Astaire's final musical is a befitting exclamation mark to his film dancing career. 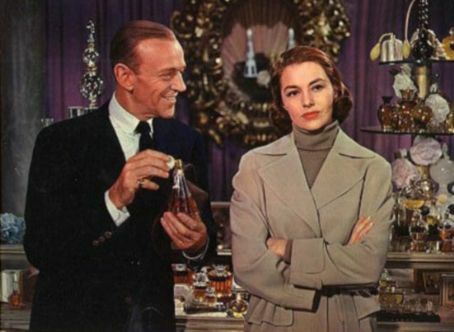 A musical remake of Ninotchka (1939), Silk Stockings has humour, romance, colourful secondary characters, enough of a story to provide weight, and a luminous Cyd Charisse to help Astaire shine one last time. In Paris, American film producer Steve Canfield (Astaire) has recruited Soviet music composer Peter Boroff (Wim Sonnefeld) to score his latest movie. This causes panic in the Soviet Union, where Boroff is perceived as a national treasure not to be associated with enemy Western influences. The authorities quickly dispatch three agents, Comrades Brankov (Peter Lorre), Bibinski and Ivanov to bring Boroff back home. But Canfield smoothly convinces the three agents to enjoy the Parisian life, corrupting them into a prolonged stay in a luxury hotel. The horrified Soviets counter by sending their best operative, the incorruptible no-nonsense agent Nina Yoschenko (Charisse) to Paris, to retrieve Boroff and the three bungling Comrades. But Canfield is not to be easily dissuaded from his plans, and sets about the difficult task of seducing Nina, romancing her with his chivalry and the charming beauty of Paris. Silk Stocking forgoes any of the special effects or camera tricks that had crept into popular musicals earlier in the 1950s, and just focuses on showcasing two magnificent dancers. Rouben Mamoulian gives both Astaire and Charisse plenty of opportunities to sparkle to the music of Cole Porter, and they reward him with performances of the highest calibre. Charisse is at her prime in Silk Stockings, and once she enters the fray, she elevates the movie with a series of lusciously fluid performances. In her title tune ballet dance, Charisse no less than makes love to the camera, in a sensual awakening of what it means to be a woman rather than a comrade. In All Of You with Astaire, she demonstrates remarkably flowing movements in the plainest of communist dresses, and she matches him stride for stride (or is he matching her?) in the light hearted Fated To Be Mated. Back in Russia, Red Blues finds her leading a high energy number to bring life to grim housing compound. At 58 years old, Astaire holds his own with dancing that is more smooth and supportive of Charisse than dynamic, but saves his best till last. The Ritz Roll and Rock simultaneously satirizes and acknowledges a seismic shift in the musical landscape with the emergence of something called Rock 'n Roll, Astaire recognizing that his type of music was coming to an end, and gracefully bowing out. In support, Peter Lorre is the funniest of the three Soviet agents who quickly succumb to the elegant luxuries of Paris, and his other two cohorts (played by Jules Munshin and Joseph Buloff) bring robust and grizzled relief while contributing to the resolution of the romance across the Iron Curtain. Silk Stockings marked the end of an era. The grand, light-hearted, gentlemanly and suave song and dance screen musical dominated by the likes of Astaire, Ginger Rogers, Gene Kelly, Judy Garland, Frank Sinatra and Charisse had run its course. If there had to be an end, Silk Stockings proved to be a fine denouement and final salute to one of Hollywood's most golden genres.